IP licensing can be a great source of revenue generation for companies with significant patent portfolios. Take Qualcomm for instance, which generates billions in patent royalties every year. Arm Holdings is another amazing example which makes all its revenue by licensing its Intellectual Property solely. This revenue can further be invested to fuel innovation. But it is all easier said than done. You would agree with me on this: Licensing patents is a very COMPLEX process. When your company boards on the patent licensing ship, it gets exposed to a whole new world of customers and the imminent challenges, which makes the whole process daunting. But there’s good news. The good news is that this complex process can be simplified if we follow a systematic approach divided into multiple small steps. 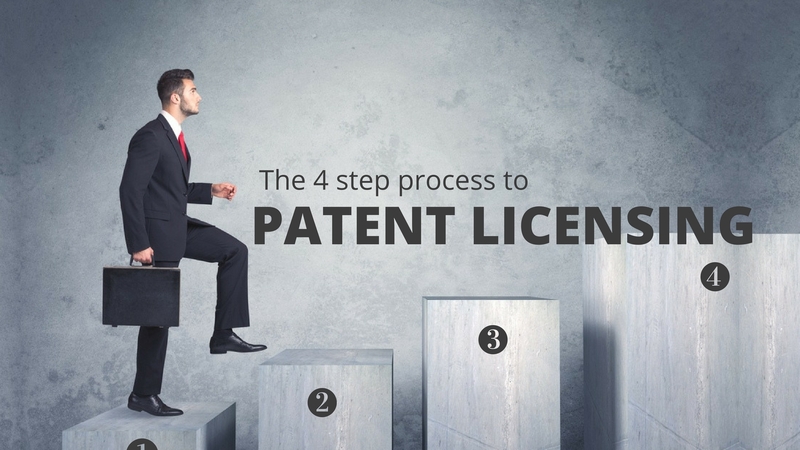 What if I tell you that I know an approach that could help you achieve your patent licensing goal in four simple steps? Let’s elaborate each step one by one. Before you go to the market you should know what you want to offer. It might seem like a very easy thing – you may claim that everyone knows what they have and what they want to sell. But that is majorly not the case. For anyone with more than a couple dozen patents in their portfolio, making up their mind on what to keep and what rights could be given up can be a difficult decision. If you are sure about which patents you exactly want to license, skip the remaining paragraphs and jump to the next pointer. Others, read on. Which are the important patents which are currently used in your products? Which are the patents which are not related to your products but might be useful to other companies that are not your competitors? Which are the patents that were once used but we have moved to the latest technology and those might be useful for the companies that are still holding to old technology? Next, you need to assess the size of the market that you are going to target. Filter out the patents accordingly. One tip – here you may want to consider patents that encompass companies from a variety of industries so as to help you can cover a huge proportion of the market. Next check the size of the companies working in that domain. The bigger the better. All in all, this step helps you in two ways: first, you get to know the patents that could be licensed and second, it gives you the patents that are of no use. You might abandon those patents or you could license them too. Yes, you could license undervalued patents too, which otherwise would have been of no use to your patent portfolio. Whom do you license them to, you ask? Well, there is a tool that could, in fact, help answer this question, a dedicated product search engine which returns products that are relevant to your patents. Utilizing this data, companies could be targeted and patents relevant to their products could be licensed to them. Want to know more about this tool? If yes, click here – GreyFox – A tool that helps sell or license undervalued patents. Once you have a list of patents that you want to monetize via patent licensing, you have to find who could take a license for those patents. In this step, you have to find companies that could get benefited from the technology your patent(s) are covering. For instance, alleging infringement of 3 of its patents before Twitter’s IPO, IBM sold 943 of its patents to Twitter for USD 36 Million while entering a cross-licensing agreement. Majority of these patents are related to digital data processing, which is an important part of Twitter’s business. Identifying the right target can help a big deal, in the long run, be it licensing or selling patents. “Get an understanding of whether they need your intellectual property or whether this is just a convenience. Is this something they can walk away from? This step is not generally easy as licensing or sale initiatives are based on the technical similarity between the patents and products. Once you have the list of patents, here is what you need next. List of potential targets – You should have a list of all the potential targets who can be approached for licensing. Evidence of Use – To prove overlap or similarity, you would also need evidence of use which lists the companies and how they are overlapping on the technology you have patented. This requires a detailed level of search and digging in the product literature of different companies and establishing a correlation between the patented technology and the one being used in a product. At such a time, you may have to perform reverse engineering to locate the proof for your patented technology being used in the product. Reverse engineering can often help figure infringers of your patents and help turn patents into a money generation asset. With this step, most of the work is done. Next, you would need to calculate the value of your assets and the way you want to approach the licensees. After the first two steps, you are done with all the hassle and now it’s time for deciding the reward for yourself. Multiple factors play their roles in assigning a monetary value to a patent set of a patent family. We have covered methods of evaluating a patent elsewhere in the blog. You could access it here. If not, we really recommend going through this presentation on valuation methods. This is the final step of a patent licensing program. In general, if a licensee receives a letter from an attorney, though it is offered to license, it may have connotations of “I’ll sue you if you don’t opt for licensing”. Hence, it would be up to you to decide whether you want to go ahead with attorney route or want to follow another route where your organization sends an offer to license without involving a patent attorney. A lot of organizations prefer the option of Open Licensing Program. Unless you specifically want to target some company, this option is good and hurts no one. You simply add your patents publicly for licensing and organizations interested in the technology could get a license. If that sounds like a good option, here is a list of marketplaces where you can buy, sell and even license patents: 22 Marketplaces to buy and sell patents. Not very complicated anymore, is it? Any complex process can be performed as long as you simplify it to multiple simple steps. Even a process like patent licensing. If you are eager to explore other clever ways to commercialize your patents, check out these strategies – Patent monetization strategies. I like that you talked about how you must hire an experienced consultancy firm in finding the companies that you want to monetize via patent licensing because this can involve complex steps. A friend of mine has her ideas that she believes a lot of company can benefit from. It’s important for her to find the right companies and offer them what she has for patent licensing. I believe that it’ll be helpful for her to find a consulting firm that can help her to find the companies that she can be partnered with in getting a license for her patent. I will make sure to share your blog with her so she can get some tips. Hi Sharon, thanks for stopping by. You must guide her and help her find a right firm — forward this article as well ;). What we’ve observed that many a time a licensee picks a less qualified firm for the monetization task and fails to get the value s/he would be getting from his/her patent set. This leads him/her to believe that patent monetization doesn’t work and other similar notion. It’s important to share and spread the right information and pieces of advice.